A bizarre introduction video with a mix of animation and live action shots of sidewalks and buildings, along with an incredibly forboding industrial-esque tune set the scene for a rather odd game. 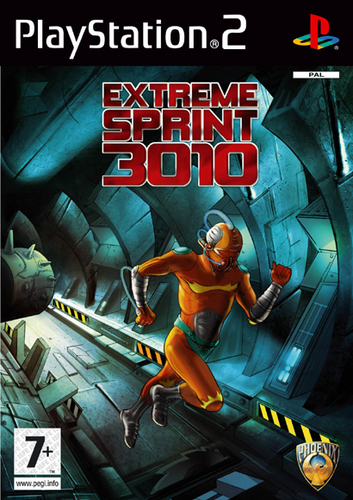 "Extreme Sprint 3010" is very much reminiscent of an older Namco arcade game called "Metrocross", but with a 3D perspective. If that reference makes no sense to you, or you can't be assed doing your research, imagine a game based on the boulder chase from the beginning of "Raiders of the Lost Ark", but with traps to avoid along the way. Hell, I believe there was a similar section in "Dragon's Lair", too. Maybe the second one? It's time… to start… RUNNING! Your bloke has to run a few laps around a course covered in sawblades and barrels to jump over, pipes to avoid and things to jump under, all the while being chased by a giant spiky-wheeled tank thing. 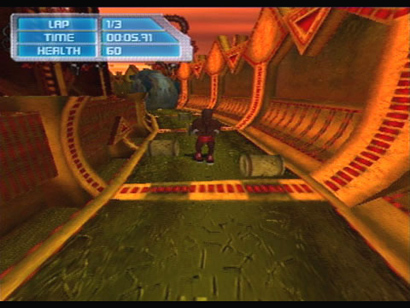 It's not bad, but by the time you've finished three laps of the same course, you'll be very bored - so that doesn't bode well for completing multiple tracks to unlock further tracks, or other characters - all of which I bet are remarkably similar looking. Unfortunately, there's not a lot here to really hold your attention for more than half an hour at best, but I enjoyed it a little bit, and that's more than I can say about many of these Phoenix games. There truly is no God.